This month I thought the whole time that I was going to go over budget but somehow I came way under. I'm actually weirdly worried right now that I don't have enough summer clothing in my closet (maybe because I haven't done laundry in a while) so I was actively looking for things, but just didn't find many I liked. There were a couple of things I returned this month. I was actually really excited about this dress, it's beautiful in person, but sadly the top has no stretch and it just looked odd on my larger bust. I also really wanted these heels (and wore them around the house for a long while trying to make myself love them) but the metal band at the top was way too restrictive and uncomfortable. BaubleBar Tassel Necklace - originally $44, on sale $29.80. I haven't actually gotten this yet (it was backordered) but I have a feeling I'm going to love it. Loft Navy Sweater - originally $59.50, on sale $35.70. Got a compliment from my 19 year old cousin on this, which made me feel pretty hip and cool so it will probably be in heavy rotation all summer. Looks great with the white shorts I picked up last month. Old Navy Pink Dress - originally $29.94, on sale and used rewards $5. I was looking to add another dress that could be easily dressed up or down, and this one fit the bill. I wore it to my cousin's shower a couple weeks ago and got a ton of compliments, so it was definitely worth the $5 I spent. Of course, I then felt overly confident and kept it on while cooking and somehow got oil splattered all over it, so we'll have to see if it survived the laundry. BaubleBar Tassel Bracelet - originally $34, on sale $22.80. I bought this at the same time as the necklace, except that it actually came and I've been wearing it basically nonstop/annoying my sister with it. Old Navy Coverup - originally $26.94, on sale and used rewards $7. So it turns out I've never owned a "real" coverup before (I always just wore old dresses) and I'm super loving this one! The cut is surprisingly flattering. Can't wait to wear it to the beach (and on our honeymoon!) this summer. JCrew Factory Shift Dress - originally $108, on sale $45.90. Shift dresses aren't the most flattering on me, but I just couldn't resist this print. Both of my grandmas have 90th birthday parties coming up in the next month, and I'm excited to pull this out for one of them. Topshop Romper - $50. I didn't really expect this to work on me. Since I'm tall they usually don't fit right, and a wrap top like this, while in theory is supposed to be flattering on curves, usually ends up showing way more cleavage than I prefer these days. Somehow this worked! I wore it to my friend's bachelorette party last weekend (you can see a picture here) and it felt so fun. I can't tell for sure how I'll do for June, I'm either going to go nuts buying summer clothing for our honeymoon, or I won't have any time for anything and will spend zero dollars. Either way, I'll schedule a budget post to go up while we're off in Italy to let you know how I did and share a recap of the first half of the year. Did you budget in May? How did it go? Wow, it looks like you got a LOT for that amount of money - awesome deal hunting! Isn't it great when you think you're going over budget and end up coming in under? I love everything you got, and they were all such great deals! I am sooooo jealous you got the J. Crew Factory dress. By the time I found it, my size was sold out. So lame. I'm also mildly obsessed with that romper. You're a tad smaller than me, but I know we both carry a little more up top so I may have to try it. Can't believe your wedding is this month!! So so exciting! And that honeymoon? Dang girl, I'm jealous. That Topshop romper is gorgeous! I love the little lace details on the sleeves. Love the pink dress! I hope it survives the laundry for you. At $5, it was an absolute steal! I love that black romper, that is just SO adorable! I think the budget is a great idea, I really should do that. looks like it made it!! Girl, I have a size 12 of that dress sitting in my car I need to return if you want it ;) I had to size down to a 10. Love it all!! 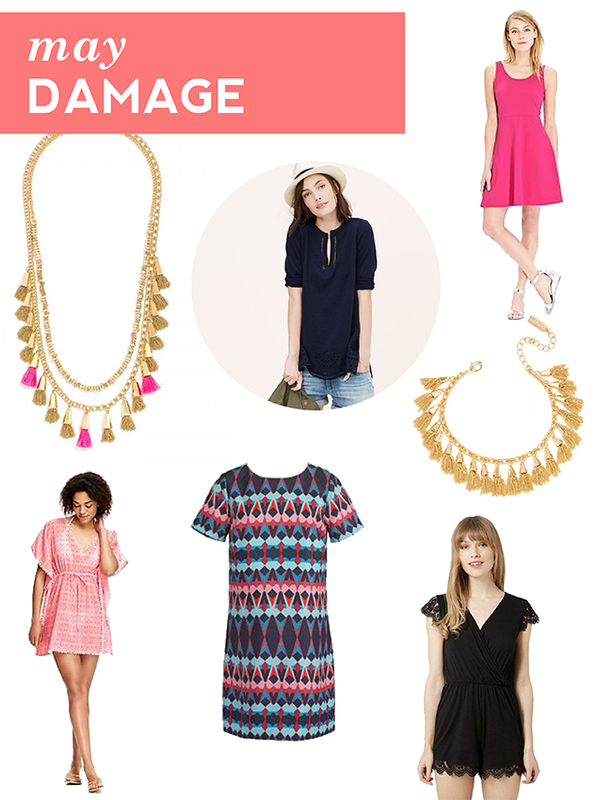 Especially the black romper and first necklace with the gold and pink! I always love your monthly purchase recaps (pretty sure I say that every month too, haha!). You got some great items and you can't beat the savings you made either. That pink dress is really pretty. Love the tassel accessories they are so in right now! I love everything you got! Those necklace is so pretty!